FAYETTEVILLE, Ark. — U.S. sprinter Wallace Spearmon Jr. was injured Saturday in a 200-meter race at the Tyson Invitational at the University of Arkansas. The Fayetteville native pulled up in the final strides of the race with an apparent hamstring injury. Spearmon finished with a time of 21.17 seconds, second in his heat behind Baylor senior Trey Harts (21.00). Spearmon declined comment afterward. Spearmon was originally scheduled to run the 400-meter race and the 60-meter preliminaries on Friday, but he was scratched in both races. 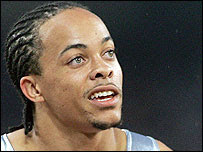 Running on his home track, Spearmon was leading the race and looked to be challenging the world’s fastest time of 20.69 in the 200 this year before the injury. Spearmon finished third in the 200 in the World Championships in Berlin last summer. He finished 12th in the event Saturday, second among professionals. Panama’s Alonso Edward, the silver medalist in that event, ran the fastest time in the 200 on Saturday of 20.70 seconds. Edward’s time was also 0.01 seconds off his personal best in the 200. “This is really great to be my track meet of the season,” Edward said. In the women’s 200, Bahamian sprinter Debbie Ferguson-McKenzie ran the women’s fastest 200 this year with a time of 23.04 seconds. USA sprinter Shalonda Solomon finished second in the event in 23.15 seconds.